CAPE TOWN (4 December 2018) – Animal protection groups Humane Society International/Africa, the EMS Foundation and the Elephant Reintegration Trust have joined forces to persuade Johannesburg Zoo in South Africa to move a 39-year old female elephant called Lammie who is living a lonely existence since her mate died in September to a sanctuary. Lammie and her mate Kinkel had been together for 17 years, and during her 39 years of captivity, Lammie has also endured the death of her parents and the relocation of her brother to a French zoo. Elephants develop strong social group bonds and losing friends can result in significant grief and trauma. Lammie now spends her days alone in her enclosure without the company of another elephant or adequate enrichment. Elephant experts at HSI/Africa, EMSF and ERT are concerned for her mental well-being. The good news is that the campaigners have identified a suitable sanctuary, referred to as a rewilding sanctuary, that is ready and willing to offer Lammie a forever home, where she can thrive emotionally and physically with a group of elephants who would become her new family in a wild-like setting. So far, however, the zoo has resisted moving Lammie and has even suggested that it may acquire another elephant. This would be a missed opportunity to do the right thing for Lammie, and a mistake, as the zoo is not able to meet the needs elephants have and should not have elephants on exhibit. The organizations have asked several times for an urgent meeting with the Johannesburg Zoo, the Johannesburg City Council and the Executive Mayor of Johannesburg, Mr. Herman Mashaba. Subsequently, a detailed relocation proposal as well as a report on Lammie’s behaviour and welfare were submitted to the parties. Observations conducted by an independent elephant researcher have revealed that Lammie’s well-being is compromised as she experiences little environmental enrichment, has little shade, insufficient water in which to bathe, and appears to listlessly stand at the gate of her elephant house for hours on end. She also appears to be overweight, likely because as a lonely elephant, she has little incentive to be active and eating is her main stimulation to break up the monotony of the day. A statement by the National Society of the Prevention of Cruelty to Animals confirmed that the zoo is considering bringing in another elephant. HSI/Africa’s Delsink added: “We are extremely disappointed that the zoo may be considering acquiring another elephant for its exhibit rather than taking the opportunity to give Lammie a far better welfare outcome elsewhere. This is an opportunity to do the right thing for Lammie. Acquiring another elephant would simply be repeating the cycle all over again, and the claim that it is for educational value holds no merit. Seeing elephants in a sterile environment where their social, psychological and physiological needs cannot be met provides no conservation or educational value. 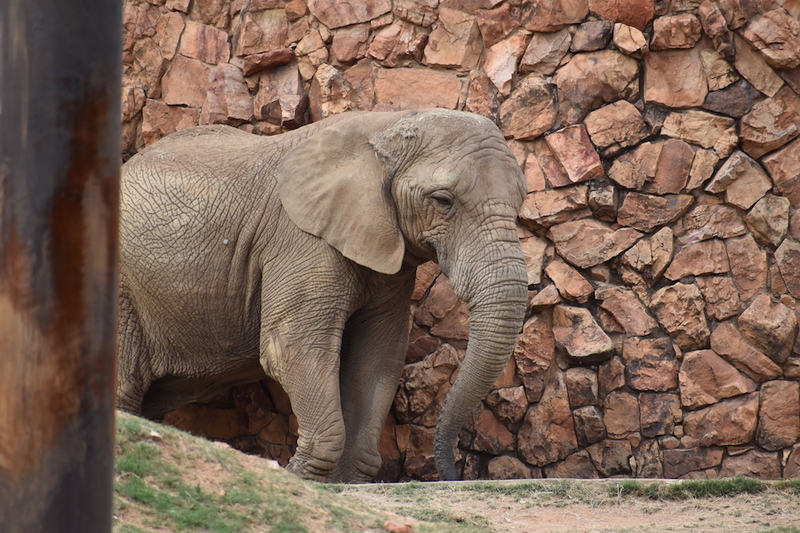 Humane Society International/Africa is urging its supporters to take action by signing a petition urging the authorities to close the elephant exhibit at the Johannesburg Zoo and relocate Lammie to a rewilding sanctuary where she can live out her years wild and free from captivity.